CALGARY — As Canadians, we can’t help but be pretty engaged with what’s going on in the political landscape with our American friends South of the border. And let’s face it, unless our Prime Minister is doing something captivating — like dancing the Bhangra in New Delhi or wearing Star Wars socks — Canada doesn’t get mentioned in the American news cycle all that often. While we are in many ways similar to our American counterparts, there are undeniable differences. For example, we use the phrase ‘sorry’ more than is probably socially acceptable in other countries (even our top music superstar made a hit single repeating the word). We weren’t chomping at the bit to elect a reality star to the highest seat in our political office (cue the country’s majority sayonara to Kevin O’Leary) and we just produced a $10 bill which features a woman for the first time ever: Viola Desmond, a civil rights activist from the 1940s. Indeed, we Canadians often revel in the ways we are different from our American cousins, and in the things we have that they don’t, whether that’s universal health care, gun control, or our devotion to the game of hockey. 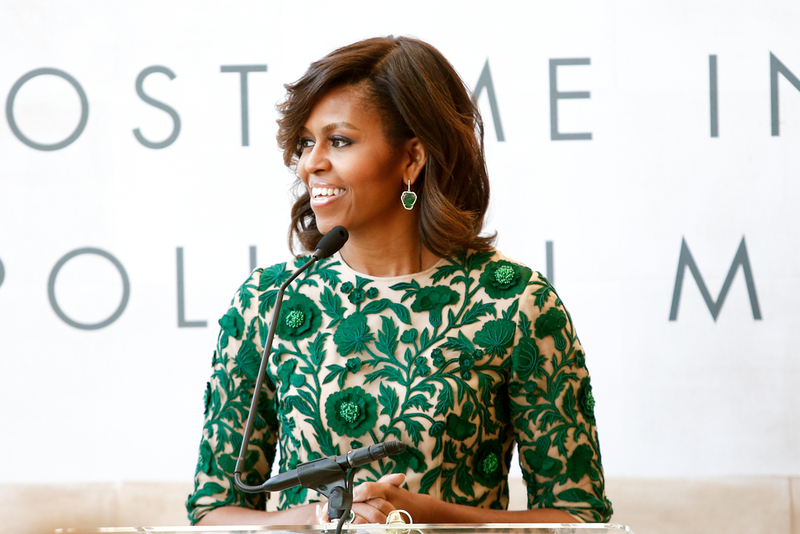 But one thing we don’t have is anyone like former U.S. First Lady Michelle Obama. Her star power, and her ability to offer spot-on intellect, mixed with effortless grace and a wealth of inspiration, is something most Canadians are able to identify with – regardless of her nationality. Ms. Obama serves as a modern, progressive female leader who holds values true to people from all over the world and from many different walks of life. And while we have many inspiring female leaders in this country, none are on the same level of recognition as Ms. Obama. So, when it was announced that Ms. Obama was going to be coming to Canada for speaking engagements in Montreal, Vancouver, Edmonton, Calgary and Saskatoon, Canadians from coast-to-coast were buzzing with excitement – and Calgarians were no exception. With less than a few days to go, the countdown has officially begun for Ms. Obama’s arrival in Cowtown. Despite the recession in Alberta, shelling out a few hundred dollars to hear Michelle Obama speak was a no-brainer for many Calgary women. Given that our province has been ruled by the oil and gas industry and other traditionally male-dominated industries, women in Calgary are hungry for a message of hope and a vote of confidence that we can indeed, break down barriers and shatter the glass ceiling that still looms over so many of us. So, why is it so important that we hear her speak? During a time in which women are increasingly being encouraged to be confident, empowered and compelled to come forward with their truths, it seems women in Calgary are longing for some sage advice from the former First Lady. She is an international icon who represents one clear message – women hold the ability to define what their future looks like. And while our province and city are currently experiencing an economic downturn and grim employment opportunities, she brings with her a message that the only limit to our future successes is how hard we work now. Now defines what later looks like, and later defines what our future holds for generations to come. Ms. Obama’s visit to Calgary will bring together an army of women in the city, who are likely standing tall on their own high diving platforms, but who are debating whether or not they should leap into a new career, fill out their university application, leave a toxic relationship, write the GMAT or apply for a more senior role. Many are wavering on the edge because they’ve convinced themselves they aren’t smart enough, strong enough or deserving enough to take the plunge. To many Calgary women, she represents a glimmer of hope, a sliver of empowerment, a foundation of peace, and a grain of inspiration. She’ll use her powerful and poised voice to create a bellowing echo which will reach every soul, heart and mind in the arena. Her speech will serve as a symbolism of hope, optimism and inclusiveness. In fact, it was her phrase of “when they go low, we go high” that set a standard for the next generation, despite not being an actual candidate. It’s her innate ability to speak simple truths like this, that forces people to stop and listen. And through this talent, Ms. Obama is able to inspire women of all ages to use their voices productively, confidently and strategically, giving rise to a new generation of leaders and a much-needed change in dialogue. And that’s perhaps exactly what Calgary women are going to feel inspired to do (and continue doing) after they walk out of the Stampede Corral on March 23.